Homebound seniors like 96-year old Bence rely on Meals on Wheels year-round, however, there are some times that may be more important to him and others like him—the holidays. Whether it’s Thanksgiving, Hanukkah or Christmas, a special holiday meal and the warmth of a visit does a person good. That’s what Holiday Meals on Wheels provides—a warm-hearted volunteer with a smile and a delicious and nutritious meal for a senior who might be otherwise celebrating alone. Bence is a WW II veteran who has been living on his own since his wife of 66 years, Gaynell, died a few years ago. He can no long drive or get out on his own, so he relies on Meals on Wheels deliveries for hot, nutritious meals. Equally important is Judy, Bence’s Meals on Wheels volunteer for the past three years, because while she bring him his meals, she also checks on him and spends a little time visiting with him. With all that time together, Judy has learned a lot about Bence and heard lots of stories which she really enjoys. 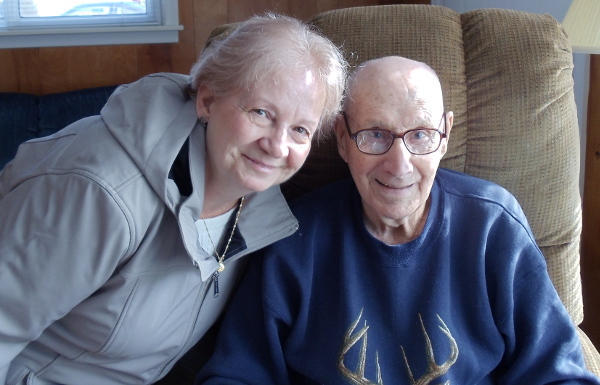 Bence’s story is one of thousands of seniors like him receiving Meals on Wheels. But you should know is that the Holiday Meals on Wheels is not funded like the daily meals that are delivered. That’s why the Area Agency on Aging 1-B depends on donations from people like you to help make this program available. Over 8,000 meals will be needed this holiday season. A donation from you will help ensure that homebound seniors throughout southeast Michigan enjoy a warm, festive meal and a visit from a friendly volunteer on holidays like Thanksgiving, Hanukkah, Christmas, New Year’s Day, Passover and Easter. Want a real warm feeling in your heart during the upcoming holidays? Wrap your heart around a senior by donating to Holiday Meals on Wheels.